This expansive crypt lies below the Shrine of Amana and is a place of rest for the living. Overseen by Agdayne and the other Grave Wardens, it is open to all visitors provided they show peoper reverence. The Crypt's custodians treat every one of its occupants with the same care and take its security equally seriously. 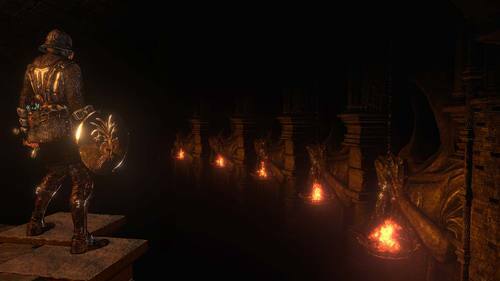 Among other things, carrying torches or utilizing magical light sources in certain areas of the Crypt is considered a desecration and will incur the Warden's swift retribution. Velstadt, The Royal Aegis stands sentinel deep within the crypt, protecting what lies beyond. Velstadt was a trusted knight who faithfully served King Vendrick in life; he followed his lord when he set out for the Undead Crypt and remained there to continue serving him in death. Velstadt and a contingent of Royal Guards stand watch over Vendrick's chamber to this very day, inexplicably slaughtering any who enter in search of the King. Vendrick, the former King of Drangleic has been reduced to a mindless Hollow, but still clutches something dear. While killing him is not necessary for the completion of your quest, putting this poor soul to rest could only be considered a final courtesy to the man who used every means within his reach and made unimaginable sacrifices to halt the spread of the Undead curse. Wall Warrior: The ghost of a former warrior which will phase through the walls of the Undead Crypt in certain spots to attack. Who were these warriors in life and how did they come to wander the halls of the Crypt? Only the Grave Wardens know for certain, and their lips are sealed. Leydia Witch: Witches who worship the god of disease, Galib. They once resided in the Undead Crypt alongside the Fenito but over time grew conceited, misusing their power and usurping control of the Crypt's gateway. Their actions spurned the Grave Wardens and they were slaughtered as transgressors; their spirits now forcibly serve as guardians of the Crypt. Leydia Pyromancer: A ghostly spellcaster of the Leydia Pyromancers. Although pyromancers in name, they were adept at a wide variety of magic and in their conceit they once occupied the Undead Crypt. Their brazen misuse of death drew the ire of the Fenito, who branded them transgressors; the apostles were slaughtered and subsequently buried in the Crypt alongside other occupants. Imperious Knight: Long ago a pair of foolish knights attempted to conquer the Undead Crypt. They each carried with them a greatshield split into two halves which they used in lieu of weapons to reduce their enemies to paste. Their ill-advised crusade came to an abrupt and unsuccessful end, however; as punishment they were denied a peaceful death and instead put to work for eternity as guardians of the crypt. "I am a Fenito. We weave death, and watch over the dead. This task was granted to me by the one who gave us the first death. Countless souls rest here. Some of them from ages long ago. Some were rich, others poor. Some wise, some dull, but now, they are all just dead." Originally imbued with the power of miracles, now soaked with dark after extended exposure in the Undead Crypt. A knight from a faraway land was lured to this accursed land, but forgot even why he came, eventually reduced to a shadow of his former self. Great hammer of the Royal Aegis. The power of the hammer's blessing has not faded completely, despite being exposed to the dark of the Undead Crypt. Unleash its latent power with a strong attack. Sir Velstadt, known as the Royal Aegis, gave himself to the King both in life and death. A member of the Fenito race, immortal guardians of the Undead Crypt who where originally given life and purpose by the Great Dead One. While his morose appearance and manner give the impress of one obsessed solely with death, Agdayne is in fact quite level-headed and inestimably wise due to the fact that he has lived for thousands of years and witnessed the lands history as it transpired. Agdayne and the other Grave Wardens take their jobs very seriously; while they welcome visitors to the Crypt as a matter of course and harbor to ill will towards humans in general, they will not hesitate to cut down infidels who would defile the graves they so miraculously attend. Robe worn by Agdayne of the Undead Crypt. Life itself is suffering; or karma, as some have called it. The embrace of death awaits all things, But does death mean an end to suffering? Ultra greatsword symbolizing guardianship over the Undead Crypt. The sword has never seen the light of day, and is steeped in dark. The wearer of this ring appears human even when Hollow. They say that in the Undead Crypt, we can reacquaint ourselves with the dead. We all suffer loss. And none of us can escape death. Then, what is the fascination with reclaiming that which has already passed in the beyond? A tiny bug that produced light. Brightbugs are said to comfort the dead, and are found in the marshlands leading to the Undead Crypt. By ingesting a brightbug just before death, the moment at which they glow most brightly, one attains great power for a short time. Often utilized as a last-resort for adventurers who have lost their way. One of the lost sorceries preserved only in the Undead Crypt. Fires successive homing souls. Extremely difficult sorcery to evade, making it very effective against frisky foes. One of the lost miracles preserved only in the Undead Crypt. Inflicts heavy damage on mindless Hollows, but has no effect on anything else. The Undead Crypt is a place of rest for the living. Those afflicted by the curse can only pray to one day gain entrance. One of the lost pyromancies preserved only in the Undead Crypt. Creates a gentle, warm flame that heals those who touch it. Fire can be a show of strength, but it is also a symbol of wisdom and comfort. Fire is what the caster wishes it be. Robe worn by Leydia witches. Leydia apostles worship Galib, god of disease. They once resided in the Undead Crypt beside Fenito. The Leydia witches grew conceited, and began to manipulate both the onset and curing of diseases, making themselves the effective gatekeepers of the crypt. Staff used by Leydia witches. Imbued with a special magic, making it a catalyst for sorceries, miracles, and hexes. Leydia apostles are adept at magic, and wielded unique weapons, but were deemed blasphemous and slaughtered. Robe of a Leydia pyromancer. Leydia apostles, in their conceit, occupied the Undead Crypt and misused death. This invoked the ire of Fenito, who branded them as transgressors. Small shield used by Leydia apostles. Imbued with a special magic that allows spells to be deflected by parrying. The Leydia apostles were inhabitants of the Undead Crypt, but failed to treat death with the proper respect. As punishment, they were denied peaceful deaths. Straight sword wielded by Leydia apostles. Imbued with a special magic that makes the Blue Flame both a sword and a magic catalyst. Execute a strong attack to emit magic. The Leydia apostles, adept at magic, wielded unique weapons but were hunted down as traitors. Grave Wardens are charged with watching over the Undead Crypt. They are soaked and permeated with the power of darkness, and they will use that power to fulfill their duty as guardians of the crypt. Be you brave knight or depraved slave, those who disturb the Crypt will be hunted down. Only… why are these Wardens so far from the Crypt they are sworn to protect? Mask worn by wardens of the crypt. No notable effects. Designed only to block light. The Wardens of the crypt watch over the slumbering dead, making sure they are not awoken. Be they King or peasant, wise or dull, rich or poor, the wardens treat them with the same care. Top worn by wardens of the crypt. The Wardens of the crypt watch over the slumbering dead, making sure they are not awoken. Be they King or peasant, wise or dull, rich or poor, the wardens treat them with the same care. A silver-black spear imbued with the power of dark. The grave wardens vowed to ensure the tranquility of those who slumber in the Undead Crypt. If one dares disturb them, the grave wardens make no allowance for stature or riches, and will readily bury them along with the others. A silver-black shield imbued with the power of dark. The equipment of the wardens of the Undead Crypt are soaked in its darkness, and permeated by its power. The grave wardens are said to know the name of every guest who rests in the crypt, no matter how long they have been with them. Armor worn by once-proud knights. Relics of a party who long ago attempted to conquer the Undead Crypt. For this act of conceit they will never rest in peace, and instead serve as crypt guardians. Shield of the knights who long ago attempted to conquer the Undead Crypt. They bore no weapons, only a shield split into left and right halves, which they used to playfully crush their foes until their corpses where kneaded beyond recognition. The engraving depicts two messengers from the hereafter who welcome the recently dead by reviewing the merits of their deeds in life. Armor worn by once-proud clerics. Relics of a party who long ago attempted to conquer the Undead Crypt. For this sin their deaths have been postponed, so they may serve as crypt sentries. The mace of formerly high-ranking clerics. It is combined with a sacred chime, and can cast miracles and hexes with strong attack. The clerics held venerated positions once, but now, their souls wander aimlessly in the depths of a murky darkness.